Calls have been made for new tourist signage near one of Aberdeen’s most beloved city centre landmarks. More tourists have been spotted around the Granite City this year, bolstered by a weak pound, and the Castlegate is a popular spot to take pictures and explore the heritage. 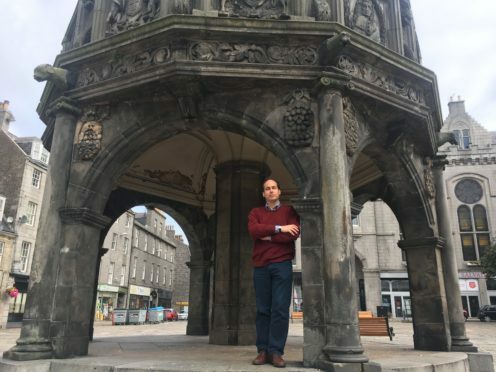 But a sign for the 17th century Mercat Cross has recently been removed by council chiefs following a spruce up of the area. And now, Liberal Democrat councillor Martin Greig has argued more needs to be done to promote the city’s heritage. He said: “It doesn’t make sense that this major landmark has no indication of its history or function. “Visitors are likely to go away scratching their heads when they come and look at this distinctive monument. “People will wonder what is its purpose. We should be celebrating our important buildings and sharing their stories. “There is a real opportunity to link the Castlegate with St Andrew’s Cathedral in King Street and Shiprow as part of our core city centre heritage. “The cross has been at the heart of the city for well over 300 years. It has been one of our key historical landmarks and is immediately recognisable as a symbol of the city. Designed and built from sandstone by John Montgomery in 1686, the cross was the site where new monarchs were proclaimed with a locked staircase leading from ground level to the top where announcements were made. In documentation seen by the P&J, council officers state: “With regards to the signage, the Mercat Cross is depicted and labelled on the wayfinding totems which are located across the city centre. “However, these do not contain any historical information about the structure. “This information was previously available on a sign in place on the Castlegate. “But this appears to have been removed during recent work to declutter signage across the city centre following on from the installation of the wayfinding totems.